So today Nissan officially pulled their name from the Radio Shack team. Quick year-end review: Nissan. Rabobank. R8 (Petrol). Big Mat. All pulling out of pro cycling in the past few months. What's poignant...and should cause some serious change in Aigle... ought be the inescapable fact that these companies - all of whom bought into professional cycling as a (positive) publicity vehicle for their brands -- are writing big checks to NOT have their name associated with what they obviously now deem a sordid show. They'd rather not get the publicity they're paying for, because they feel the association is that bad for their brand. "We'll pay you but would rather our name not be associated with you lot anymore... in any way, shape or form." Once was on a business trip in Nice, France. (Nice alright... I know!) It was June 1999, and I was driving to the airport, listening to the radio. The machine-gun rapid fire French broadcaster relayed a quick update from the prior day's Dauphine Libere - the hillclimb Time Trial up Mont Ventoux. The news was that US Postal American Jonathan Vaughters had won the stage, breaking the record Charly Gaul, set during the Tour de France in 1958. Thanks to JV's integrity, we all know now where some of the turbo boost came to win that one. 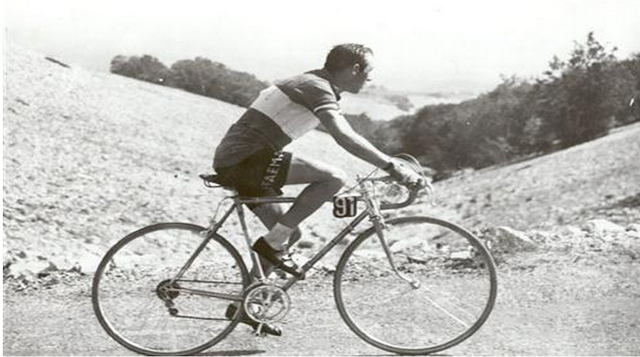 Here's an interesting, different photo of Charly Gaul during his record setting Time Trial stage win in '58. 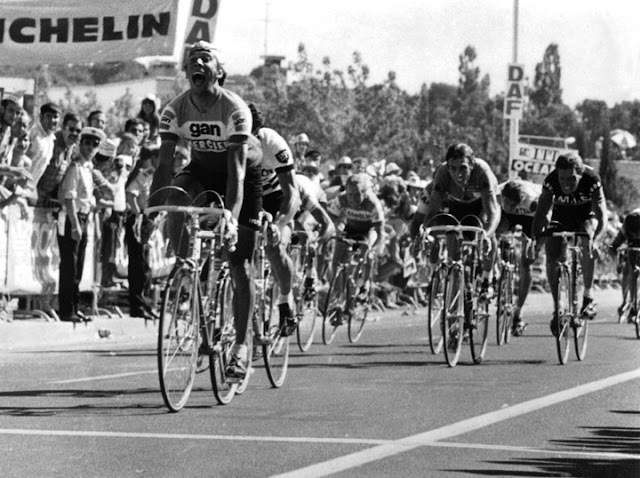 "The UCI have Formula One in their head..."
Six degrees of Ferdi Kubler. Quick, who's the oldest living Tour de France winner? Yup, Ferdi Kubler. The Eagle from Adliswil, near Zurich, Switzerland. 93 years young. Living proof that if you live right and have the right outlook, age can be just a number. 'Ferdi National' they call him also. A national hero. They say only Roger Federer comes as close in the popularity stakes there. Gives you some idea of his stature. 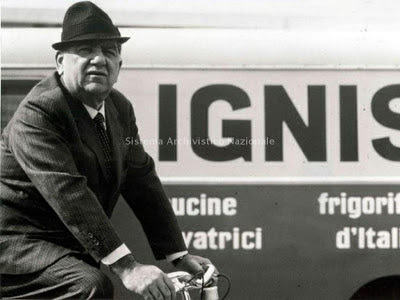 Most know that Ferdi famously won the 1950 Tour de France. Soon be 63 years ago. Think about that. 1950, the year when Gino Bartali took his toys, and all his Italian boys (maillot jaune Magni too!) onto a train back home, protesting violent fan threats. Like his namesake eagle, Ferdi swooped to seize the moment. He was flying and held off young upstart Louison Bobet to win 'his' Tour de France. He'd later swap podium places with Bobet in the '54 Tour in the middle of the Breton's triple, finishing 2nd and taking the green points jersey. Forget racing, this politics stuff is waaay better! Flahute's rant du Jour. Wow, why do they call this the off season? There's been more action and maneuvering on world cycling's political front than we saw during the entire 2012 Tour de France. Way better spectator sport than radio controlled cycling. Certainly a better battle! Where to begin, so many bones to pick, so little time... no wait, Flahutehas all the time in the world. Unleash the hund...and here goes. Change Cycling Now. First, a public service announcement. Join the movement. Sign the petition. Like it on Facebook. And whether you like it or not, please support it. And get those you ride with to support it too. A new start doesn't need to be perfect. It just needs to happen. Now. You're the ones who pay for this show. Cycling belongs to you. 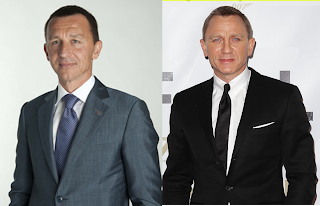 Not the suits. Not the riders. Not the teams. To you the fans. The participants. Force their hand. If you're disgusted and outraged, act. You've got no voice now. What do you have to lose? Here's an old-school victory salute for ya cafesupporters. 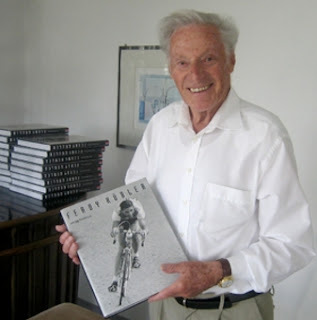 Barry Hoban. And the heads-up scream. YeeEEEAAAAAHHHHH!!! No hands in the air required. And no Forrest Gump, Hulk flex or fake phone calls. Nope, just a head thrust up in joy over locked arms, and the simultaneous, gutteral release of a primal victory scream. And that wide open mouth acting as an air-brake. Even in old B&W stills, the look on the face said it all. It was enough. Perfect even. Kids these days should take note: Less is more. Way before there was Cav, there was Barry. Going over with a few hundred quid to his name. Tom Simpson's understudy. Gent dwelling expat. Longtime member of old school Tonin Magne's Mercier stable, soldier in PouPou's inner circle.